My darling grandson recently turned 7 (heavens - seven! where did those years go!!) his current fad is Star Wars ... so I said I would make him a Star Wars cake for his birthday. Now this was one of those spur-of-the-moment things that instantly caused me some consternation as I am NOT into cake decorating ... not into fancy food making at all really. 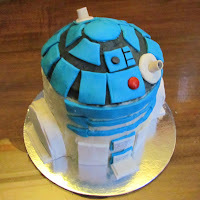 R2D2 is tall with a domed 'head' so obviously the cake would be in tiers - this is a basic butter cake recipe made in double quantities and divided into 3 parts. 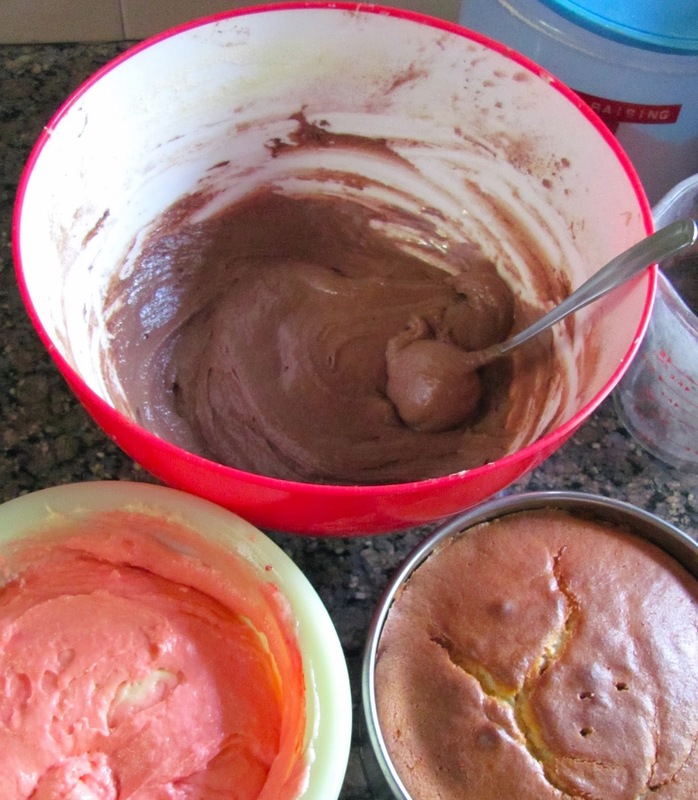 Plain vanilla for the bottom layer is just out of the oven & still in the 6" tin, pink (because my grandson has a sister!) 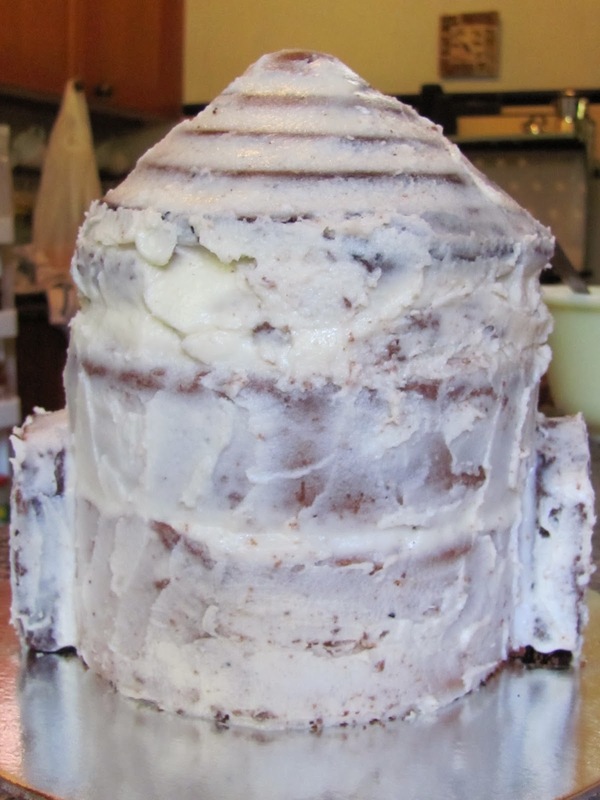 is flavoured with rose flovouring and will be the middle part and the chocolate flavour will be the 'head' and there is less of that. 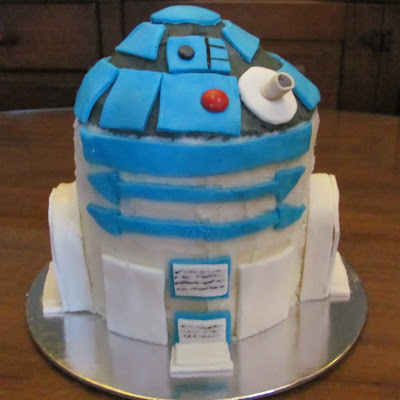 I had found pair of cake tins designed to make a giant cupcake ... used the top half tin for the 'head' of R2D2 but it was too conical. Joined the 3 cakes with strawberry jam and added R2D2's 'arms' on the side - these were a commercial brownie cake sliced in half as I really didn't feel like baking another cake! 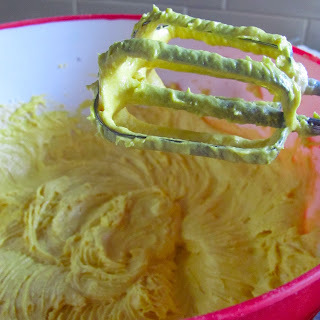 One tip I picked up from my www research was to do a 'crumb coat'. A layer of thinned out icing to even out the shapes (such as those swirly ridges from the giant cup-cake tin) and to stop the crumbs getting into the final coating of icing. Really wish I'd known about crumb coats years ago!! 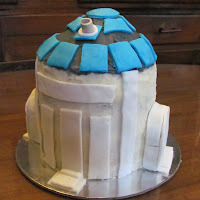 Once that was set I slathered the top coat of icing on. Icing is really unhealthy stuff, being basically just butter + icing sugar!!! On the shopping trip I had bought some black food colouring, it was very strong and the grey for R2D2's head was perhaps a little dark. Then I needed a 'fondant' or 'royal icing' for all the decorations - one that could be rolled and cut out in shapes. 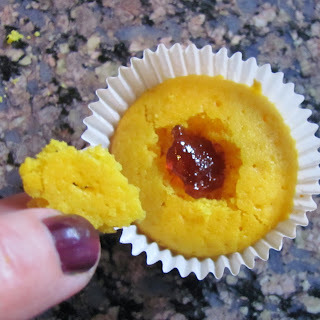 Didn't want to use a commercial one as those often taste very strong (like marzipan) and children don't like that. 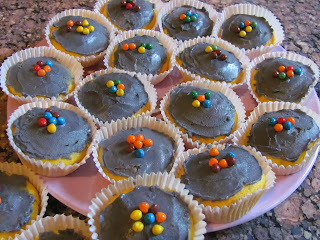 The same www site as above has a recipe for fondant icing that started with marshmallows ... Ok - that seemed possible and my hubby could eat all the pink ones but the recipes said to zap the marshmallows in a microwave oven and I don't have one of those. So, I chopped up the 'mallows put them in a little saucepan with a very small amount of hot water, put the pan over gentle heat and lots of stirring until the 'mallows melted and kinda frothed up. 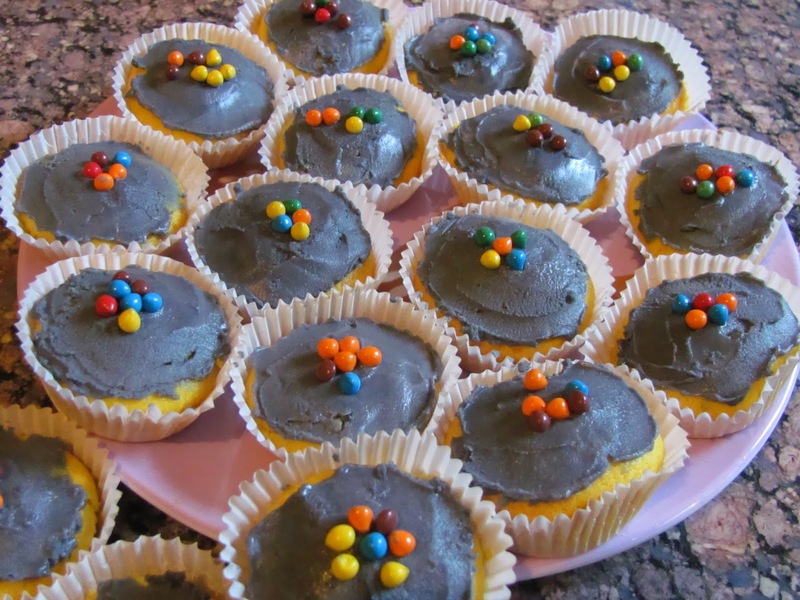 Then added the icing sugar and stirred like crazy ... it worked !! :-) I had a fondant icing that I could roll out & cut into shapes - though you do need to oil or grease all the surfaces or it will stick. 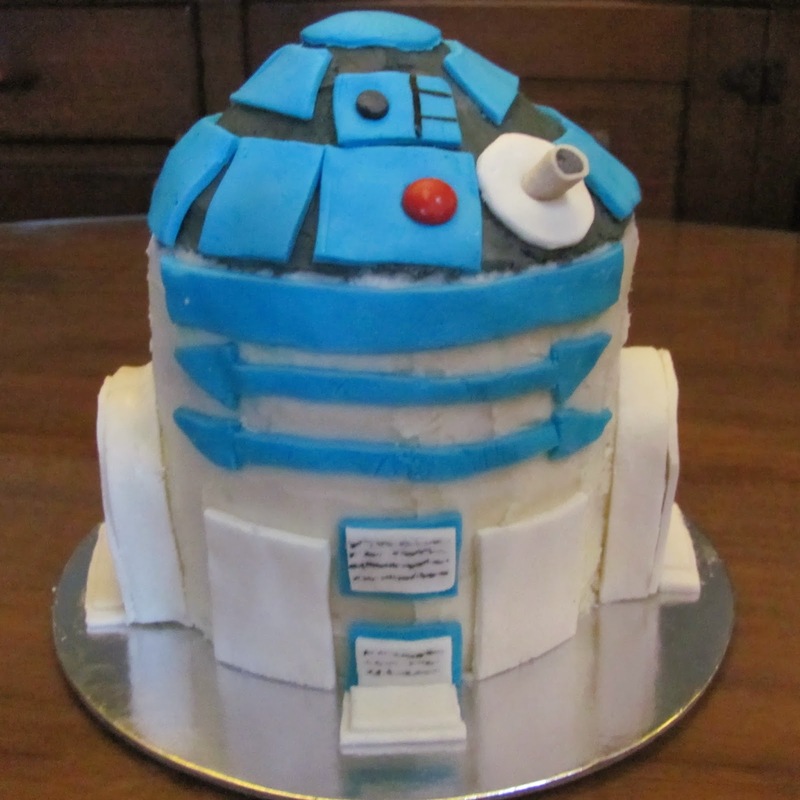 Here is the finished R2D2 cake - I was very proud of it even though it has plenty of flaws and the children loved it. The children helped with the decorations, the red dot is a Smartie, the black details are that food colouring applied with a clean small paint-brush, the 'cameras' are a sour licorice lolly cut to size. from the top - not very accurate but fun! 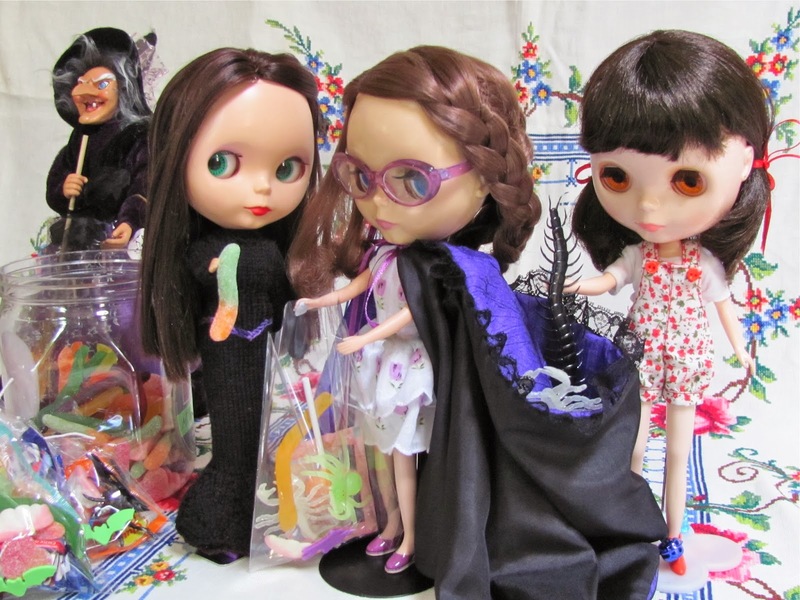 Meanwhile, the Blythe Dolls were meant to be helping me by filling the lolly-bags for visiting Trick-or-Treaters. Ruby & Lillian were working hard - but Audrey was up to tricks of her own! 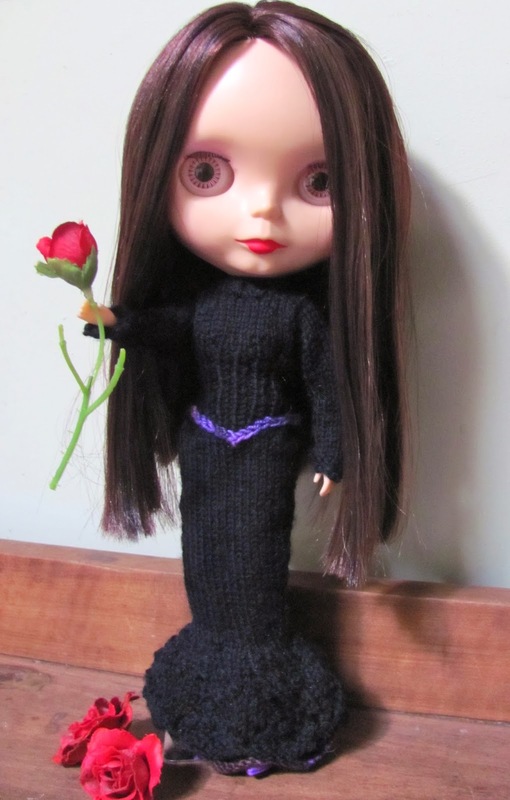 Ruby is my new girl - she is a Rosie Red BL and came to me with a wonky hair-do - I've given her a partial re-root (more in my next post) ... Ruby can do a marvelous Morticia Addams impersonation (imdollation?) now.